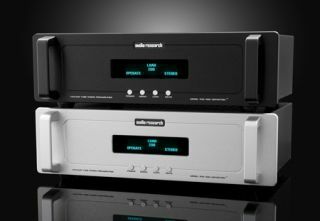 Audio Research introduces a pair of new phono preamps | What Hi-Fi? High-end hi-fi specialist Audio Research has unveiled a brace of new phono preamps, designed to elevate LP playback to "a new level". The PH6 is available now for £3368, the PH8 goes on sale in June for £6298. Cheap they ain't. So what do you get for all that money? Well, the PH6 is a hybrid phono stage with a low-noise, high-gain JFET input stage, and it incorporates two high-current 6H30 twin triodes in the gain and output stages. Audio Research claims users can expect more than 4000 hours use from the tube set. Cosmetic changes run to silver handles and small aluminium buttons under the LED display; black front panels and black handles are also available. The front panel buttons control power, mute, mono and loading, the latter giving a choice of 47K, 1000, 500, 200 or 100 ohms. The rear panel includes one pair of single-ended inputs, a ground post and a 15A IEC connector. As for the PH8 model, it too uses twin 6H30 tubes, plus the same type of capacitors as used in Audio Research's flagship Reference Phono 2. There's also a new R-core transformer and circuit board material is the same as used in the firm's Reference products. Audio Research products are distributed in the UK by Absolute Sounds.